A research team led by the University of Alaska Fairbanks and Colorado College has solved a century-old mystery involving a famous red waterfall in Antarctica. 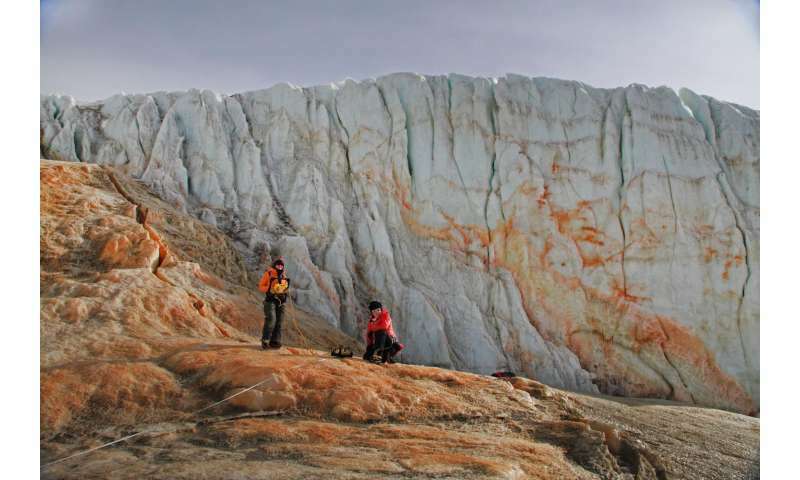 New evidence links Blood Falls to a large source of salty water that may have been trapped under Taylor Glacier for more than 1 million years. The team's study, published in the Journal of Glaciology, describes the brine's 300-foot path from beneath Taylor Glacier to the waterfall. This path has been a mystery since geoscientist Griffith Taylor discovered Blood Falls in 1911. Lead author Jessica Badgeley, then an undergraduate student at Colorado College, worked with University of Alaska Fairbanks glaciologist Erin Pettit and her research team to understand this unique feature. They used a type of radar to detect the brine feeding Blood Falls. 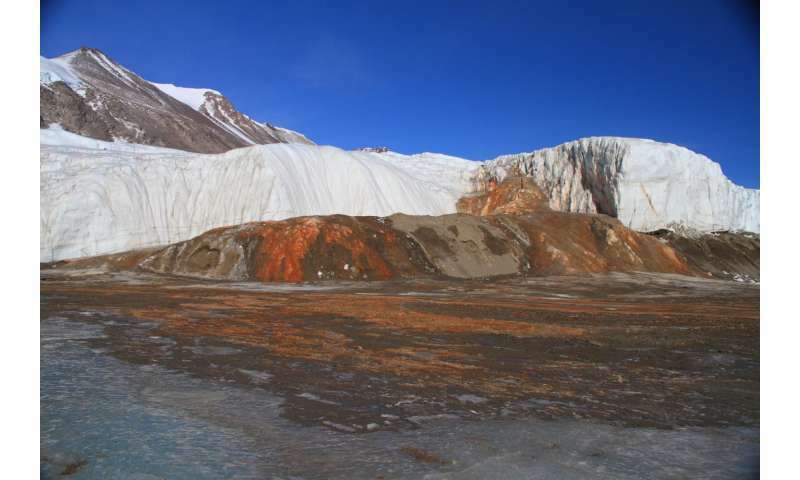 "The salts in the brine made this discovery possible by amplifying contrast with the fresh glacier ice," Badgeley said. Blood Falls is famous for its sporadic releases of iron-rich salty water. The brine turns red when the iron contacts air. The team tracked the brine with radio-echo sounding, a radar method that uses two antenna—one to transmit electrical pulses and one to receive the signals. 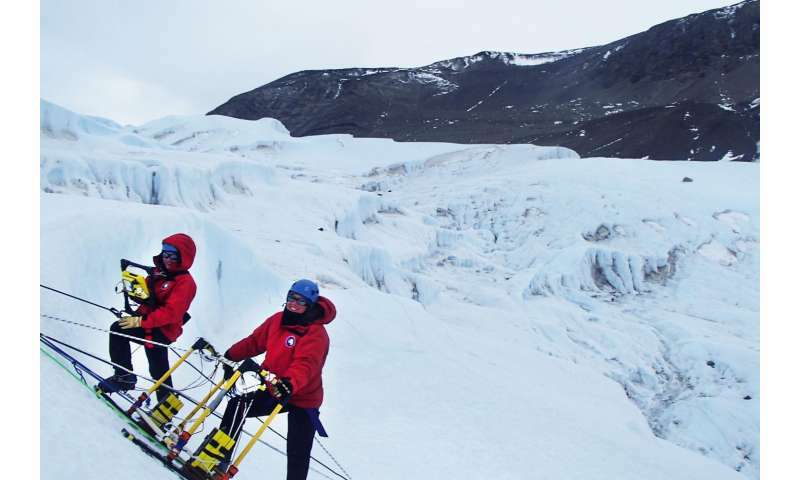 "We moved the antennae around the glacier in grid-like patterns so that we could 'see' what was underneath us inside the ice, kind of like a bat uses echolocation to 'see' things around it," said co-author Christina Carr, a doctoral student at UAF. Pettit said the researchers made another significant discovery - that liquid water can persist inside an extremely cold glacier. Scientists previously thought this was nearly impossible, but Pettit said the freezing process explains how water can flow in a cold glacier. "While it sounds counterintuitive, water releases heat as it freezes, and that heat warms the surrounding colder ice," she said. The heat and the lower freezing temperature of salty water make liquid movement possible. "Taylor Glacier is now the coldest known glacier to have persistently flowing water." Pettit said she enlisted Badgeley as an undergraduate student to help with the overall mission of understanding the hydrological plumbing of cold-based glaciers. "Jessica's work is a perfect example of the high level of work undergraduate students can do when you give them a challenge and set the expectations high," she said. Erin Pettit, left, and Cece Mortenson collect radar data on Taylor Glacier in front of Blood Falls. Credit: Erin Pettit.